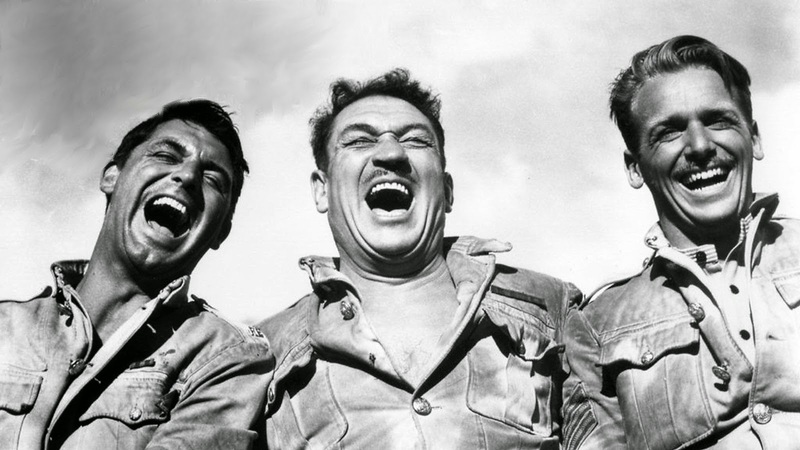 Cary Grant, Victor McLaglen and Douglas Fairbanks Jr. take on the brutal Thuggees in Gunga Din. The Stars: Cary Grant; Victor McLaglen; Douglas Fairbanks Jr; Sam Jaffe and Joan Fontaine. Source Material: Anglo-Indian writer Rudyard Kipling's 1892 poem about an Indian bhisti (water-carrier) who saves the lives of a British regiment. 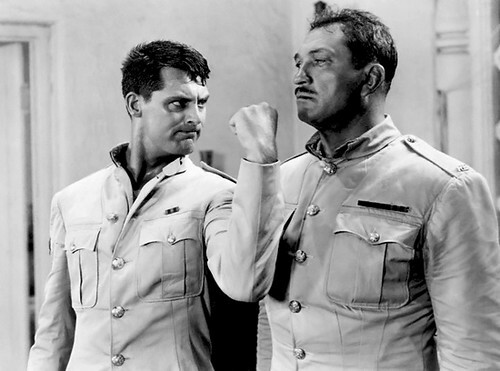 Cary Grant and Victor McLaglen in Gunga Din. Awards: Nominated for one Academy Award: Best black-and-white cinematogrpahy for Joseph H. August. The Plot: Three misfit soldiers (Grant, Fairbanks, McLaglen) and their loyal bhisti, Gunga Din (Jaffe), must stop the notorious Thuggee cult, who are bent on destroying a British regiment. 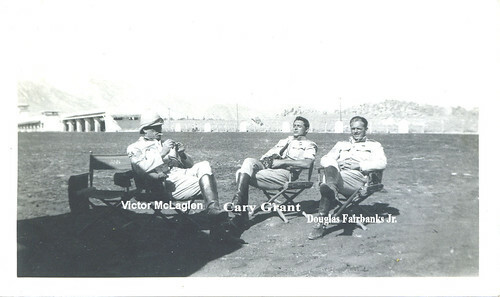 The stars of Gunga Din on location in the High Sierras. This photograph was found in a garage sale. You can click on the photo for more details. Backstory: Films about the British Raj in India -- Lives of the Bengal Lancers (1935), The Rains Came (1939) -- were hugely popular in the thirties and Hollywood was especially eager to adapt the works of noted Anglo-Indian author Kipling. Kipling would not sell the rights to Gunga Din but, after his death in 1936, producer Edward Small bought the rights from Kipling's widow for 5,000 pounds. Southern author William Faulkner began working on the script turning in a decidedly Faulknerian take on the story with the loyal Din being portrayed as a drunken gambler. Small and director Howard Hawks (Hawks was at one point supposed to direct Gunga Din) decided that a much lighter take was needed for the material so they hired the screenwriting team of Charles MacArthur and Ben Hecht to turn the story into an action-adventure romp. The Thuggee Temple set in Gunga Din was built in the High Sierras. This photo was found at a garage sale. You can click on it for more information. Best Performance: Cary Grant as Sgt. Archibald Cutter. Sam Jaffe deserves some kind of a medal for wearing that ridiculous get-up for three months, but the undisputed star of Gunga Din is Grant. He was originally slated to play the Douglas Fairbanks Jr role, but the ever-shrewd Grant bargained his way into the more showy role of the gold-mad Cockney sergeant. Grant uses all of his considerable skill to play Cutter: he puts his background as an acrobat and juggler to great use in the highly choreographed fight scenes (watch the way he juggles a stick of dynamite) and his impeccable comic timing is spot-on. Grant basically invented the insouciant action hero that would become so popular in the seventies and eighties: Indiana Jones and Hans Solo are both descendants of Sgt. Cutter. Best scene: Sgt. Cutter and Gunga Din infiltrate the Thuggee temple (clip below). Best Line: "You're a better man than I am, Gunga Din!" Colonel Weed (Montagu Love) quoting Kipling's famous poem. Location Shooting: RKO chief Pandro S. Berman was hoping for a relatively quick and inexpensive shoot for Gunga Din, but location shooting added costly expenses and caused the film to run considerably behind schedule. 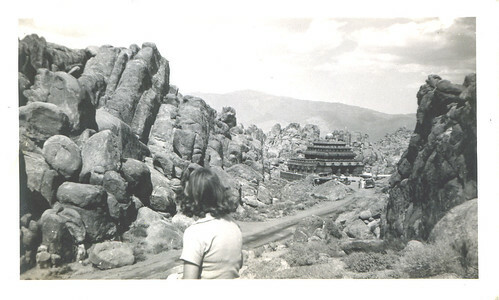 Stevens filmed Gunga Din on location in the High Sierras. The native village was built about five miles from the town of Lone Pine, Calif., with the English barracks built about six miles further away on some flat desert land. The Thuggee Temple was built higher up in the Sierra mountains. The entire village set burned down during the filming causing production delays while construction crews from southern California had to head north to rebuild the set. The behind the scenes photos I posted here are from a gentleman on Flickr who found them in a garage sale. You can click on any of the photos for more information. 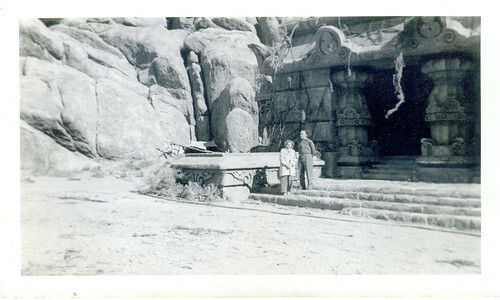 The Thuggee Temple set from Gunga Din. This photo was found at a garage sale. You can click on it for further information. Kipling cameo: Gunga Din features a cameo by Reginald Sheffield as a young Kipling. Kipling's widow was so incensed by this creative license that she insisted Sheffield's small part be removed from the film. It has been restored to modern versions of the film. Fun Fact: Annie the Elephant was portrayed by Anna Mae, a retired circus elephant who appeared in many films including Charlie Chaplin's City Lights (1931). A vintage poster for Gunga Din. Why it's essential: Gunga Din has its issues: it is in no way an accurate representation of the British Raj, the Indian people or Hinduism, but it is one of the most entertaining movies to come out of old Hollywood. Directors like George Lucas and Steven Spielberg drew heavily on its buddy comedy and fast-paced action adventure sequences (if you want to know where they got the Indiana Jones snake sequence, watch Gunga Din) for the big budget blockbusters of the seventies and eighties. 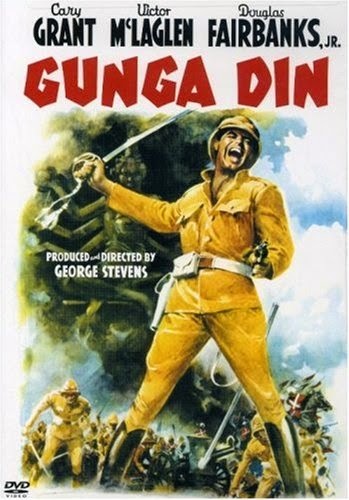 Availability: Gunga Din is available on DVD and video on demand. Next week, James Cagney is a World War I veteran turned bootlegger in The Roaring Twenties.